Chloe Loewe was a chemist and researcher; she was awarded a PhD in Biochemistry (c. 1950) from the University of London. She was registered as a Pharmaceutical Chemist in 1940 and worked as a researcher at King’s College, London in the laboratory next door to the one where penicillin was discovered. 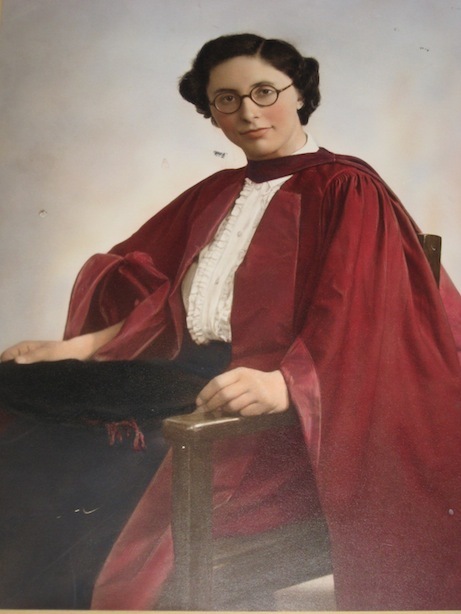 In 1948 when the National Health Service began she was working as a hospital pharmacist, and she became a fellow of the Pharmaceutical Society of Great Britain in 1954. She published several research papers including a project she worked on with her husband, Raphael Loewe called: ‘Treatment of Calculus in a fragmentary Hebrew Pharmacopeia” [1963?]. The fragment is held in the Raphael Loewe archive and is exhibited underneath her portrait. To read more about Chloe and see other exhibits, click here: RLA Digital Exhibition. This entry was posted in Exhibitions, Loewe Archives and tagged Chloe Loewe, Digital Exhibition, Loewe on 1 November 2013 by zeidlerm.